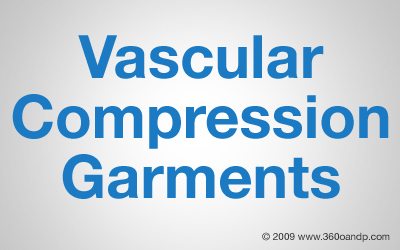 Medical compression stockings provide a graduated compression (highest at the ankle and decreasing upward on the leg) to enhance venous return of blood flow to the heart. The proper wearing of compression stockings accomplishes this by 1) reducting the diameter of the veins, 2) increasing the natural muscle pump action of the legs and increasing the vein function toward normal flow operation. With an increased blood flow rate, the possibility of blood pooling in the veins, swelling of the leg, fatigue, pain and blood clot development are reducted. Non-custom compression stockings are available in a variety of sizes, styles and compressions and are measured and fit from a physician’s prescription and specifications. Stockings must be worn to cover the affected area or any obvious varicosities by overlap of 3” (below knee, thigh high or waist high). They are available with a closed toe or more preferably an open toe allowing the use of a donnong slipper for easy application. They may come in a variety of compression grades. The compression listed is the maximum amount at the ankle and the compression gradually decreases as one moves toward the proximal edge of the garment. Very mild compression – (8 to 28 millimeters of mercury (mm hg) Anti-embolism (T.E.D.) stockings are a prophylactic measure for patients confined to bed and not effective for ambulatory patients due to their low compression. A pateitn who is reclining with their heart at the level of their lower limbs requires less compression to facilitate venous return. For this reason, T.E.D. compression stockings should not be used on ambulatory patients. Light Compression – (20 – 30 mm hg) – To be used for mild cases of venous diseases, heaviness and fatigue in the legs, mild varicosities without significant edema, post-0sclerotherapy, initial varices during pregnancy, small varicose dilations of cutaneous veins. Moderate Compression (30 – 40 mm hg) For the vast majority of vewnous diseases. Relief of aching, heaviness and fatigue caused by varices, post-sclerotherapy, post-surgical stripping, prophylaxis ofthrombosis, varices during pregnancy, pregnant patients with previous phlebitis, postural hypotension, prophylaxis and treatment of complications of varicose veins and post-phlebitic syndrome with chronic venous insufficiencies, control of edema and effective scar formation after burns, stasis dermatitis due to chronic venous insufficiency, treatment of post-fracture edema/trauma. Heavy Compression – (40 – 50 mm hg_ For higher degrees of indications for moderate compression therapy, emphasized edema from indications for moderate compression therapy, reversible lymphedema, severe chronic venous insufficiency as with post-phlebitic syndrome, chronic venous problems after surgery and venous ulcers. At the time of measuring, the patient will be evaluated for proper compression and style of garments, as requested by the accompanying prescription. If necessary, the prescribing physician should be contacted to discuss changes in the prescription that would benefit the patient or to discuss any questions in the interpretation of the prescription. Patients should be measured in the morning before any swelling can occur. If there is pitting edema present, it may be necessary to reduce the swelling with an intermittent compression s pump before measuring the patient. This insures that the patient will be measured most accurately to their reduced limb size. Measurements are taken circumferentially at the ankle, calf, mid-thigh and thigh and a length measurement from heel to popliteal space for below knee and heel to gluteal fold for thigh high and waist high stockings to insure a good fitting and functioning garment. Patients are fitted and instructed on donning, diffing and wearing their compression stockings. They are told to don their stockings first thing in the morning, wear them all day long and remove them when they retire for the evening. Patients are carefully instructed about their compression stocking function, donning, wearing and care. Patients are asked to demonstrate their ability to don and doff the garments at the initial fitting and follow-up appointments are used to monitor compliance. Donning a compression garment can be very difficult for many patients, especially those patients who have weak arms and hands, or lack range of motion due to such diseases as arthritis. There are a number of donning aids that can be given to patients. First, many manufacturers provide a conning slipper, but this can only be used with an open toe stocking. Also, a wire frame stocking holding device is available and occasionally utilized for the patient who is unable to don the stockings. Below knee and waist high stockings are self suspending while thigh high stockings may require body adhesive or a garter belt due to the shape of the anatomy. Ideally, patients should be issued two pairs of stockings so they can be rotated while a pair is being cleaned. The life expectancy of the stockings vary with the care that they are given, but may be expected to last three to four months. The use of two garments rotated has been found to give a longer wearing life than two garments in succession. Most stockings can be machine washed on a gentle cycle in cold water, rinsed thoroughly and air dried. Contrary to popular belief, the life of a garment is not shortened by frequent washings, but by the permeation of skin oils.